This is one of the best EC's albums. And my favourite albums which EC played it in concert 1986 with the great man (Phil Collins) and one of concerts that I love it because this album is very outstanding. The great songs as (Holy Mother) (Run) (Tearing Us Apart) good drum and guitar. Eric, show his skill in this album, also we must thank Phil Collins that produced this album. Listen and never be forgot! This CD is not the best for EC but certainly has songs of interest. It starts with "Its in the way that you use it" which was used as a song for a movie soundtrack with Tom Cruise. Not a great song, but a hit for Clapton. "Run" is very funky and Nathan East furnishes very strong bass lines. 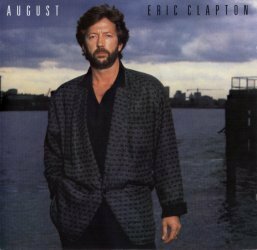 This was the first full album of the Marriage of East and Clapton who have been a team for many years now. "Tearing us Apart is the duet with Tin Turner and is a strong song that makes you wanna dance with a strong guitar solo in the middle. "Bad Influence" is a recycled Robert Cray song. Clapton's version is very much like Robert Crays'. "Miss You is one of the better songs on the CD and well worth the listen. "Holy Mother is the gem of the CD. Clapton spills his guts and provides a very powerful song. One of those songs that gets in your soul. To this day one of my favourite songs by Clapton. Behind the Mask finishes the album and is very solid. Grand Illusion was a throw in and did not appear on the original vinyl version of this album and when you listen you will know why. This album is definitely worth a listen. I think it's a great album, with a lot of details you must listen to. The sound it's amazing you'll be carry to the eighties and you'll enjoy it a lot. It's one of his best albums for me. Great songs, great band and great production. And the subsequent tour was fantastic too. For me the best songs are "Holy Mother" & "Hold On", with a very good rhythm guitar and drums. It has the 80's sound because it was recorded in the 80's! This is really great album and I rate it fifth in my own list of EC best albums. Somebody might say that this album is a torture to listen. I don't think so. You can find ''Behind The Mask", "Tearing Us Apart", "Run" and etc. Listen and have fun! This album has a good nice 80's feel to it. "Behind The Mask" is a good up-beat song Tina Turner does vocals on "Tearing Us Apart" and "Hold On". A very well done album. I think this is a very underrated album, it is great. Its in the way that you use it is a great opener to this album, great song, great solo's.